Before ascending to heaven, Jesus commissioned his disciples to “go and make disciples of all nations” (Matt. 28:18-20). As communicated in the article God’s Mission for the Church — The Great Commission, there’s much more to this directive than evangelizing the world around us. If we look at the outline from the above mentioned post, we can come up with a number of questions we might want to include in assessments. 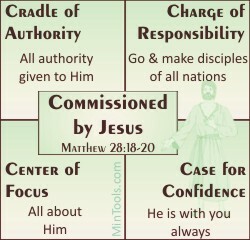 The Great Commission encompasses more than missions or evangelism as seen in a breakdown of Matthew 28:18-20. How are we doing in all aspects of the mission God’s given us? Cradle of Authority – Then Jesus came to them and said, “All authority in heaven and on earth has been given to me. In what ways do we demonstrate the need to follow Christ’s authority? Who has the final word in any decisions we must make? What steps do we take to make sure we’re yielding all aspects of what we do to the Lord’s authority? How much and in what ways do we communicate that it’s about getting people on page with the Lord rather than alignment to our personal agendas? What kind of example are leaders to the Body in obeying God’s directive? How are we seeking to build accountability into the whole body to fulfill God’s mission rather than making it a “spectator sport”? What steps do we take to ensure that we’re constantly looking at what we do in light of God’s big picture? Center of Focus – baptizing them in the name of the Father and of the Son and of the Holy Spirit, and teaching them to obey everything I have commanded you. What evidence is there that what we do is truly about God rather than about us as leaders, our church programs, etc.? How do we demonstrate that we’re as concerned about seeing people get saved as we are helping believers grow? How do we demonstrate that we’re as concerned about seeing people grow in the Lord as coming to a saving knowledge of Him? Case for Confidence – And surely I am with you always, to the very end of the age. Do we constantly look to the ever present Lord as our help or do we lean on our own understanding? Do people sense the presence of the Lord in our midst or just a lot of religious activity? Do we rely on strength our ever present Lord provides or do we depend on our own abilities? Do we find His grace to be sufficient in our weaknesses or do we let our insecurities get the best of us? ← Previous Previous post: Great Commission: Encompassing or Complicated?